QUANG NINH (VNS) — With an annual income of more than VND2.5 billion (US$111,200), a farmer in the northern province of Quang Ninh has fellow farmers queuing up to learn his new techniques in agriculture production. For more than 20 years, Pham Van Tan, 53, Cam Pha City's Mong Duong ward, has taught other households to apply technology to boost production and therefore improve their living conditions. Seeing the abundance of unused land and barren hills near his house, he decided to quit his job at Mong Duong Coal Joint Stock Company. He then asked local authorities for 59ha of land for planting trees to improve his financial situation. He had to use his family's savings and take a VND30 million (US$1,335) bank loan for his business. "At first, I thought finding capital was the most difficult thing but soon I realised my lack of knowledge in science and technology was a bigger challenge," Tan recalled. But with determination and the encouragement of local authorities he visited places where he could learn planting techniques such as in Lang Son, Yen Bai. He even travelled to China to learn. He first found success in 1997 when his family nursed enough acacia seedlings for 10ha of forest. Five years later, the number of acacia seedlings by his family nursery was enough for the family's 30ha forest with the surplus sold to neighbouring farmers. The first batch of acacia trees were ready in 2000 but Tan didn't see much profit as the price for the trees was not high. Then in 2003, acacia became in demand. It is used in coal mining and as material for paper and plywood. He earned about VND50 million ($2,225) per ha. The secret of his success lies in his planting method. According to Tan, planting acacia for paper material is not as effective as planting for a 10-year cycle. Thanks to this he earned about VND200 million ($8,900), a fourfold increase compared to normal planting. Thanks to the vast area of land and abundant food, he bred white-leg shrimp at his 4ha pond. 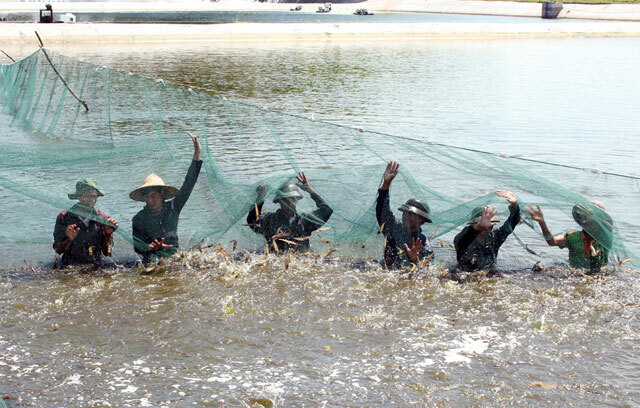 In 2009, Tan expanded the pond and started to breed shrimp on an industrial scale. Now, he harvests 20 tonnes of shrimp a year. Tan said he faced a lot of failure before his success. He had invested in eucalyptus trees since 1990 but the trees died because of his lack of experience. Then he borrowed more money from the bank to continue planting. He switched from planting eucalyptus to planting acacia and it brought economic benefits. However, the entire 25 ha of forest was destroyed in a storm in 1993. He had to sell his house for VND22 million (US$979) to invest in breeding sea crabs. With the money collected, he continued investing in planting forest. Inspired by Tan's success, his fellow farmers decided to follow him and listened to his advice. As a result, many have escaped poverty and also have enough money to buy household equipment. Apart from guiding other households on how to grow trees in an appropriate manner and how to breed shrimp, he created jobs for 30 labourers with an average income of VND4 million (US$178) per person per month.